Up to four PB-3 controllers may be used on the Shacklan network. 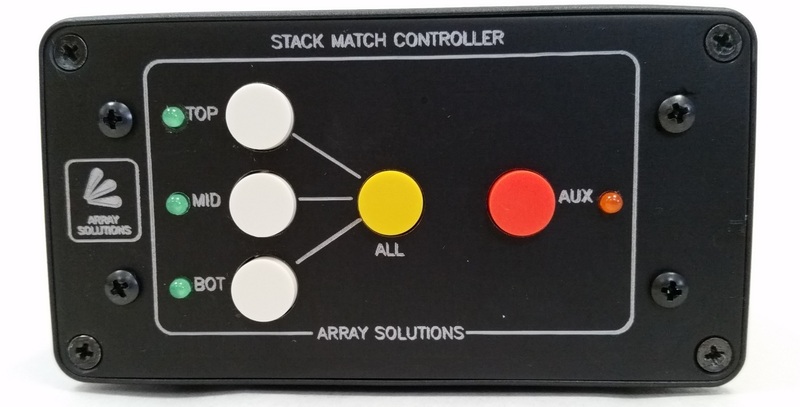 Configuration is simple using pushbutton switches on the front panel. The PB-3 has two operating modes to suit your operating preference. The default mode is push-on/push-off for antenna selection and the other is direct antenna selection. 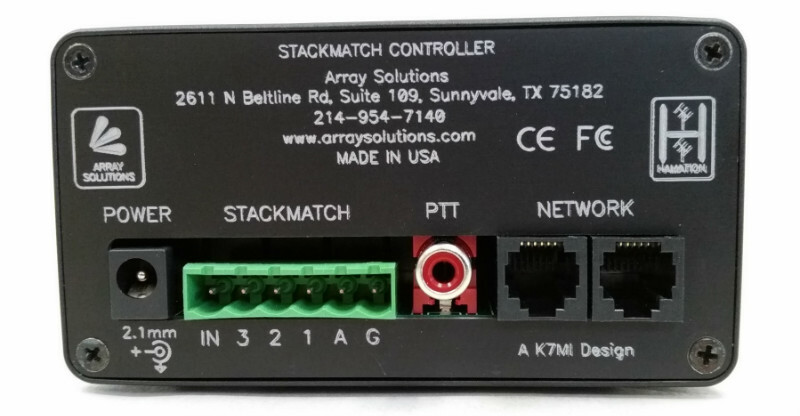 All units in the ShackLAN product line use the same connecter and pinouts for their network connections. 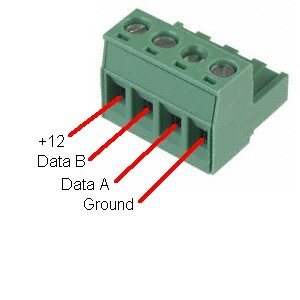 On older units, network connections are made to a 4-pin removable terminal block using the diagram below. Only a single connection to a power source is required as power is distributed throughout the network. A good, inexpensive source for the network cable is standard CAT-5 network cable. Stranded cable is recommended as solid wire is prone to breaking under the screw connectors. A good source for stranded CAT-5 cable is Monoprice. Parallel three wires for the +12 and three other wires for the Ground connections. Be sure you use one of the twisted pairs for the data connections. Only a single wire is needed for each of the data lines as they carry no current. When using CAT-5 cable, be sure to use the same parallel combinations on each unit in the system. Newer ShackLAN products use a 6-pin "RJ-12" connector, also known as a modular telephone connector, for interconnecting the ShackLAN units. Connections from the antenna switch controllers to the antenna switch still use the 4-pin screw terminal connector. Many units have a pair of connectors to facilitate "daisy-chaining" of the units. Each unit is supplied with a 36" cable. Be aware that 6-conductor modular telephone cables are rare in your local variety store. Some may have 4 conductors and can be used if necessary but many of these "cheap" cables have only 2-conductors which will not work. Only one ShackLAN device should be connected to your power supply as power is distributed over the network. For early units with only the green 4-pin connector, connect the power to the +12 and GND pins on only one unit. Later units have a separate power jack and a modular network connector. The power jack on the later units is a standard 2.1mm connector with center pin positive. Voltage should be between 12 vdc and 14 vdc. Do not exceed 15 vdc as each unit has spike and surge suppression that clamps at 16 volts. Current requirements depend on how many devices are on the network but supply of 1 amp is adequate for most systems. Those with multiple antenna switches should have at least 500 ma for each switch. A 36 inch power cable is supplied with each unit. The wire with the white tracer is positive and the solid black wire is ground. 1 - Remove the rear panel and slide the control board far enough out of the case to expose the black relays. 2 - Cut the two small wire jumpers located behind the PTT jack to the right of the relays. 3 - Slide the control board fully into the case. 4 - Install the rear panel. Connect the isolated power source to the 2.1mm power jack. Center pin is positive. The supplied power cable may be used and the wire with the white tracer is positive and the solid black wire is ground. Connect a cable from the PTT input to the PTT output on the radio if you wish to have separate antenna configurations for transmit and receive or to prevent antenna switching during transmit periods. Ground this input to activate. You will need a "Y" adapter if you are using an amplifier. The controller will blink the LED next to the pushbutton three times to indicate the unit ID. On power up the PB-3 Controller will scan thru the four LED indicators and then flash one of them three times to indicate the unit ID. The PB-3 will then flash one of the antenna LEDs with the AUX LED to indicate the operating mode. The controller is now ready for use. In Mode 1 the antenna buttons toggle the antenna selection. This is the simplest mode of operation. Pressing one of the antenna buttons will alternate between adding and removing that antenna from the stack. Note that the controller will not allow you to unselect all antennas. All antennas may be quickly selected using the ALL button. In Mode 2 the antenna buttons directly select antennas. Pressing the TOP button will select only the top antenna. Same for MID and BOT buttons. To select two antennas you must press buttons for both antennas simultaneously. All three antennas are easily selected with the ALL button. The PB-3 has the ability to switch to a different antenna configuration for transmitting. Set the transmit configuration as in normal operation and then press and hold the ALL button for longer than two seconds to save the transmit Configuration. The controller will flash the antenna LEDs to indicate success. Invalid configurations are indicated by flashing the AUX LED. The PB-3 will now use this configuration whenever the PTT input is active. Stack of two Antennas Combining System. Allows any of the three combinations for upper/lower/both ..
Stack of two Antennas Combining System. Allows any of the three combinations upper/lower/both ante..
Stack of two Antennas Combining System. 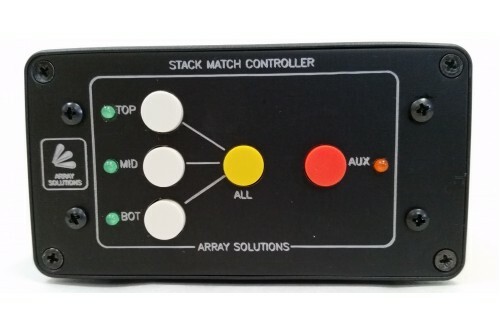 Allows any of the three combinations for upper/lower/both an..
SO-239 to N-type connector change option for StackMatch II To see more on the StackMatch, click her..
Stack of two Antennas Combining System with BIP and BOP function (Both In Phase and Both Out of Phas..
Stack Match Rotary LED Controller. Requires 12 V DC @ 500 mA. 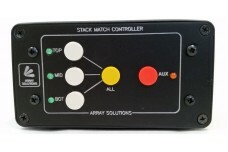 To see more on the StackMatch, c..
StackMatch II and StackMatch II Plus Push Button Controller. Rear and Front Views of the Stac.. Phase Shifter 180 degrees Mono Band SO-239 connector standard. Phase Shifter 180 degrees Mono Band SO-239 standard.Requires a 1/2 WL Coaxial Delay line (Please, ca.. Phase Shifter 180 degrees Wideband 1.8 - 30 Mhz, SO-239 connectors. Specify if N-type connectors nee..